Why does one horse get pushy, one get sullen and another flighty when they are all handled the same way? 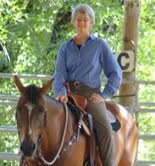 The answer is different horse temperaments respond differently to boundaries. The Wood and Wood horse combinations need very clear, strong boundaries that must be constantly enforced. The Earth and Metal horses need boundaries but they rarely test them once they are know what they are. The Fire and Water horses work better with flexible boundaries that do not squash their creativity. To help understand how different horse temperaments react to boundaries let’s use the analogy of a sales rep at a business. Say the work hours are set at 8 to 5 with a 1 hour lunch break. The Wood or Wood combo rep is very high energy and makes a ton of sales. He starts to think he is pretty special and no one is going to challenge him if he comes in late and takes an extra hour at lunch. If he is not challenged for this behavior then he starts thinking his boss is pretty weak and pushes his limits even further. The correct response from a good leader would be to bring this sales rep in and explain that although he is a valued employee his behavior does not fit in with the overall standard of excellence and that his commissions will be lowered if he continues to come in late. If he comes in 5 minutes late then the boss should follow through with his threat. Most likely the Wood or Wood combo rep will have his commission cut several times before he gains full respect for his employer and starts to be proud to work in such a well-run business. The Earth, Metal and these combo types are both loyal and hardworking and rarely test boundaries but if they see lack of leadership they can get sloppy. Maybe they come in late a few times and nobody says anything. Then it just becomes a habit. If attention is brought to their behavior then they will quickly improve it. They also want to be a part of a well-run business and consider themselves strong team players. The Fire, Water and these combos are a bit more of a challenge for a leader. These individuals are very smart and talented but they are also very sensitive and creative. Chances are they are not late intentionally and are just as likely to skip lunch breaks and stay late in the process of doing their job. When they are at work they give it 150%. With these types the strict enforcement of boundaries can discourage rather than build respect. As long as the sales are being made it can be better to avoid pointing out every time the employee comes in late and focus more on praise for extra work put in and make gentle reminders about respecting work hours. Horses, like people, need to know what is expected of them and this is why boundaries matter. Without clear boundaries there is always some doubt and confusion. By understanding how the horse temperament types respond to boundaries you can get the best performance with the fewest behavior challenges. We are pleased to announce that Horse Harmony: Understanding Types and Temperaments is now available on Kindle. We’re off to a good start spreading the information to others in this format, but are looking for people to do Amazon reviews. If you have already bought the Kindle version of Horse Harmony and will leave us a review during the month of January, we’d like to give you a free gift of the downloadable version of the Horse Harmony Feeding Guide. If you haven’t gotten a copy yet, then now is a great time to do so and get the complimentary Feeding Guide. This is a $37.50 value that you can get for free just by leaving us a review of Horse Harmony at Amazon.com and then emailing us at orders@holistichorsekeeping.com letting us know you did a review. We’ll then email you back a pdf version of the Feeding Guide. This special is only being offered for the month of January so take advantage of it now.